Totoro wants to help keep your luscious lips looking fresh and stop cracking! This EOS container is carefully hand crafted into Totoro with hard modeling compound, so it will not break when you put in your purse or back pack. Remember that funny-looking robot soldier from Castle in the Sky who wouldn’t stop taking care of the garden even after hundreds of years? Well now he’s been made into a nifty planter and will faithfully hold tender your garden. Good luck trying to not burn your bacon in the morning when cooking with this little Fire Demon! 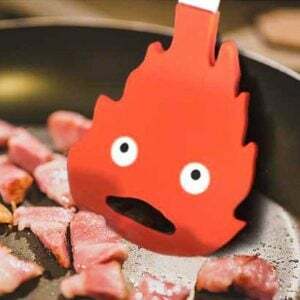 The Calcifer spatula makes an excellent gift for Studio Ghibli fans who also loves to cook. May all your bacon burn! In the name of the moon, I will dry you! Give your favorite Scout a salute as you dry off with these Sailor Moon embroidered hand towels. These bathroom accessories are made from 100% cotton and can create the ideal housewarming gift. Make your next bath time experience out of this universe with a surprise Dragon Ball Z bath bomb! Listed as a set of 5, these handmade bath bombs each feature an intoxicating scent and will reveal a hidden figure once dissolved in the tub. 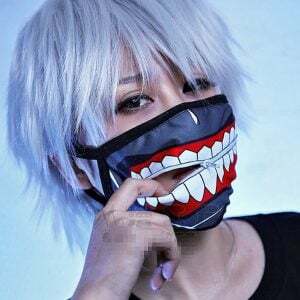 Add a little bit of ghoulish-ness to your everyday life style with this Tokyo Ghoul face mask! Features Kaneki Ken’s ghoul mask and even comes with a zipper. Works well for cosplay or to wear while cleaning the house. Yip Yip!! Now you can order your very own baby Flying Bison! This cute Appa amigurumi is expertly knitted by hand from Australian wool. If you want to make one yourself the pattern is also available and instantly downloadable.